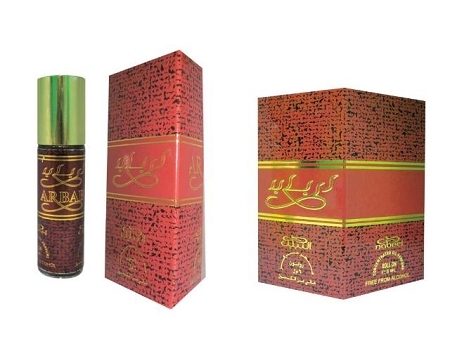 Arbab - Perfume Oil by Nabeel (6ml Roll On ). Gives out a pleasant fragrance. Try it for yourself and gift for someone special. Ingredients (as listed on the box): Perfum, Dipropylene Gycol, Alpha-isomethyl Ionone, Benzyl Benzoate, Benzyl Salicylate, Citral, Citronellol, Coumarin, Eugenol, Evernia Prunastri (Oakmoss) extract, Farnesol, Geraniol, Limonene, Linanool. 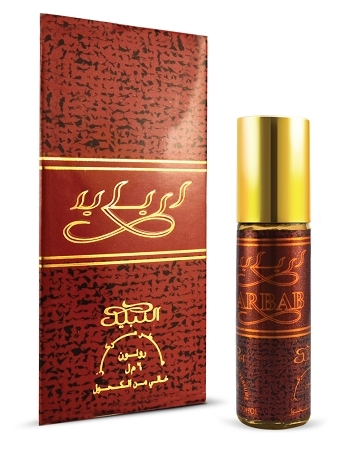 Al-Kindus the famous Muslim 8th century scientist and father of Perfume making would be amazed at this olfactory gem called Arbab. At first it reminds you of Tom Ford NOIR but the scent rapidly changes into something…lets say different. A very steamy musk and pleasant fresh shaved wood smell! WOW. The sheer brilliance of the notes speaks for itself. I think it is the combination of clove, juniper, ginger and Taragon that gives it that real musk-rust edge that you will find very pleasant. Give it a try, you will see! I will buy a box of these so I won't run out. Most of all, try it and wait for the compliments you will receive. A favorite of the women :) Mashallah! I like this very much. It's sweet but doesn't have a cloying sweetness, if you know what I mean. Instead, it's got a little 'punch' to it with what smells, to me, like something minty. It's not a strong eucalyptus scent nor is it like peppermint. More like a mint mixed with something else - maybe cedar. Anyway, it's lovely and sweet but fresh smelling. Lasts nicely. Wish they made a spray in this fragrance. This scent is incredibly beautiful. It smelled differently worn than it did in the bottle. Very lovely on a man!